When a grower harvests their cannabis plants, they process it by drying, curing and trimming the plant material. Dried cannabis ready for the consumer can often sit on retail shelves for months before it is purchased. According to the Cannabis Safety Institute, trimming is the processing stage with the highest level of human handling, and thus presents the most significant opportunities for microbiological contamination. The Cannabis Safety Institute recommends workers handling dry cannabis wash their hands periodically, generally conform to food safety rules and wear gloves at all times. In addition to these tips, looking at relative humidity is a good tool to mitigate contamination concerns like the growth of yeast and mold spores. Mold spores can grow quickly when there is enough moisture, but if the cannabis is dry enough, mold spores cannot develop. Growers controlling the relative humidity of their finished product in the past often placed an orange peel or a wet cotton ball in a jar with dried cannabis to retain the weight from water and keep it from over-drying. Those tactics have since been improved upon using modern technology. 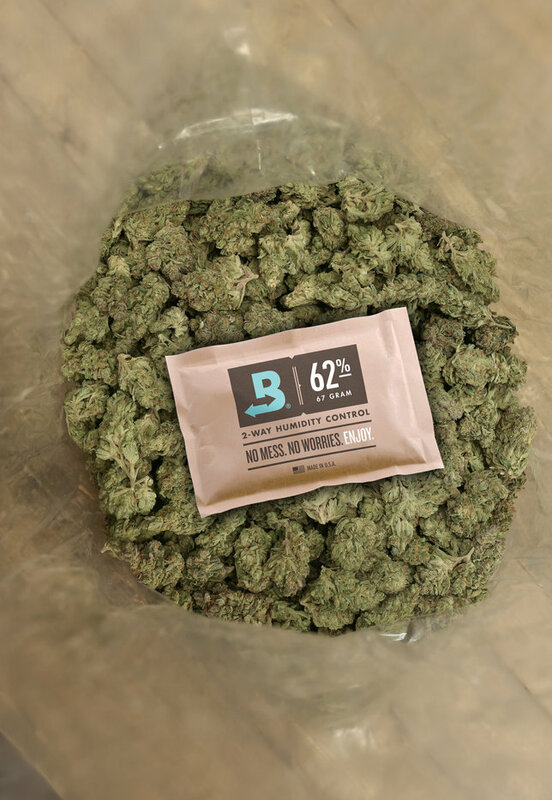 Back in 1997, Boveda first patented two-way humidity control. For the last 20 years, that company has made humidity control products for packaging in a variety of industries, like wooden musical instruments, pharmaceuticals, medical devices, electronics, tobacco, photos and documents and perhaps most notably for keeping cigars at the right humidity level in a humidor. 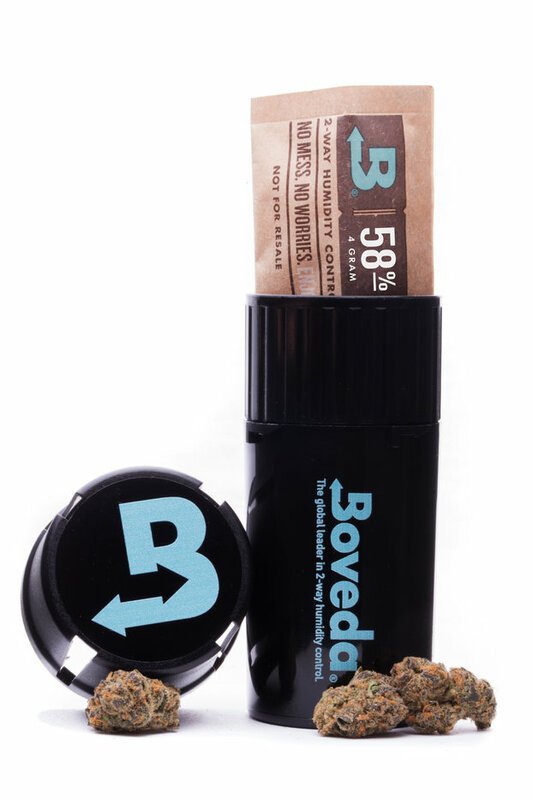 According to Charles Rutherford, business development director at Boveda, he saw people buying their products meant for cigars, but using them with cannabis. About six years ago, they started developing a product specifically for the cannabis market. The science behind it is relatively simple, says Rutherford. “Certain salts saturated in water can naturally regulate humidity- we just developed a cannabis-specific humidity level and patented the packaging around it that purifies the water and can come in direct contact with cannabis,” says Rutherford. “Using water activity meters and a moisture isotherm test, we determined the most appropriate range of humidity levels that cannabis will remain stable.” That range turned out to be between 59% and 63% humidity level for the properties in dried cannabis to stay the same. According to Rutherford, it is a little more complex than just a range to stay in. “There are different humidity levels that certain strains prefer, but there are personal preferences, regions and other factors to consider when determining the levels of humidity ideal for cannabis,” says Rutherford. “We wanted to understand what people consider to be perfect.” In their research they found that depending on the region of the country, that humidity level varies considerably. “Using a water activity meter we could tell exactly what people prefer,” says Rutherford. Colorado, for example, prefers significantly drier cannabis than the Pacific Northwest, according to their findings. 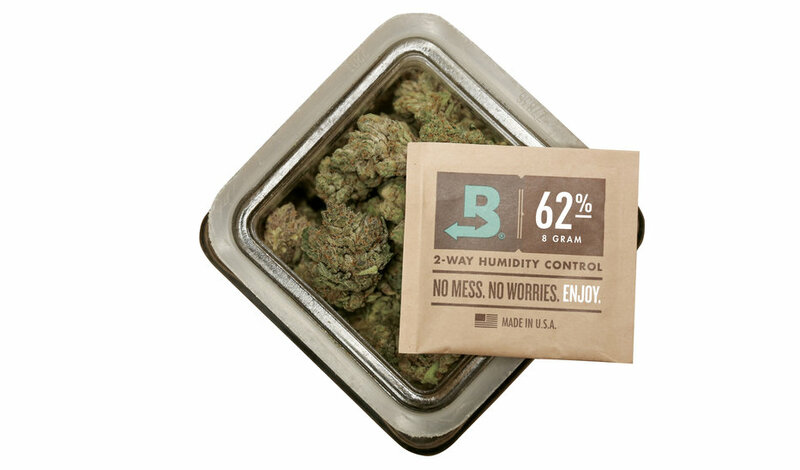 Right now, Boveda has two-way humidity controllers set at 62%, 58% and soon they will have an under 50% option (appealing to the Colorado market). Using a device to accurately control the humidity level in cannabis can help growers and retailers prevent contamination from the biggest source of concern: water. “There is a ton of talk about pesticide contamination, but the reality is even if the flower is grown organically, you can still encounter safety problems when the moisture level is off,” says Rutherford. From a medical perspective, keeping dried cannabis at an ideal humidity level helps stabilize the properties of it, maintaining the medical efficacy. “If this is something people use for a medicine, it should be at an ideal condition,” says Rutherford. “Quantifying and understanding what humidity level is right is what we are helping accomplish.” For patients with compromised immune systems that need safe, consumable cannabis, a humidity control device can help prevent contamination and ensure a certain degree of safety in their medicine. On a retail level, the packaging insert can extend the shelf life of products and maintain the quality. “The world has known for decades that 70% humidity level for cigars is ideal,” says Rutherford. “The cannabis world hasn’t had a moisture standard or understanding of what is proper until very recently.” That 62% humidity level determined after commissioned testing is a good standard to reference when determining your own ideal humidity level. Growers also recognize the value in keeping their cannabis at the right humidity level beyond the obvious safety concerns. “As cannabis dries out and loses its humidity, the overall weight is reduced,” says Rutherford. 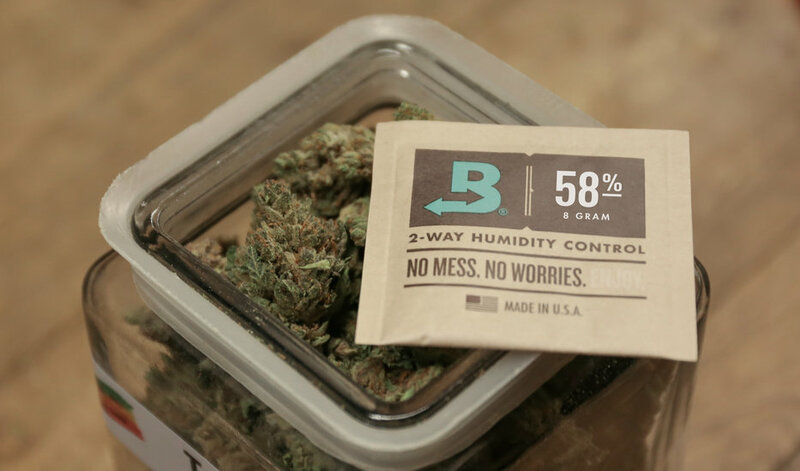 “Precision humidity control gives a uniform humidity throughout the flower, leaving out the mystery for growers and maintaining weight, meeting the nexus between quality and weight.” According to Rutherford, growers have an incentive to package their cannabis a little on the wet side. “Because it weighs the most when wet, it is sold by weight and it will lose moisture over time, the incentive to deliver product that will dry out over time- that can create a lot of problems by having high moisture content.” For the first time ever, people can dramatically extend the shelf life of dried cannabis, instead of letting products naturally deteriorate and go bad over time. “For the first time ever, it allows you to extend the shelf life of dried cannabis for aging cannabis like wine and cigars,” says Rutherford. The data from that Cannabis Safety Institute report, collected by AquaLab and CannaSafe Analytics using a vapor sorption analyzer, shows a cutoff of 65% relative humidity. These findings give the industry a lot of guidance in working to reduce the amount of yeast and mold contamination, says Bob Esse. “If your dried cannabis is above 65% relative humidity and you are a retailer, you should send that product back to the grower because it wasn’t dried properly, is vulnerable to mold and yeast spores and thus not safe for the consumer,” says Esse. Pointing to the report, Esse says foods with high moisture content are able to support robust microbial population growth, which can lead to bacterial and fungal infections. “Water activity is what impacts whether microorganisms can grow or not.” By using two-way humidity control technology, growers and retailers can mitigate risks of contamination, improve quality and extend the shelf life of their products.